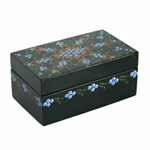 A dazzling array of blue flowers blooms on gleaming jet black lacquer. This beautiful lidded box is handcrafted by Thailand’s lacquerware artisans. 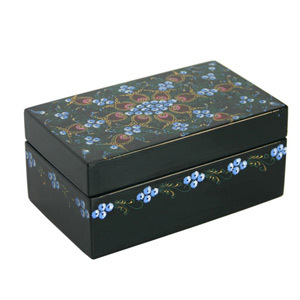 This box will add sparkle and beauty to the interior of any home. Size: 12.5 cm W x 5.5 cm H x 7.5 cm D.
Materials: Acrylic on lacquered plywood.